My card is not very spring like (since it was not made for the challenge) but I had so much fun to make it and a idea came to me when I saw these awesome bottlecap sheets Lizzy have in her Etsy store. I've used Blue Zombie -image. I cropped both images from the sheet, then printed girl x4 and heart x6. 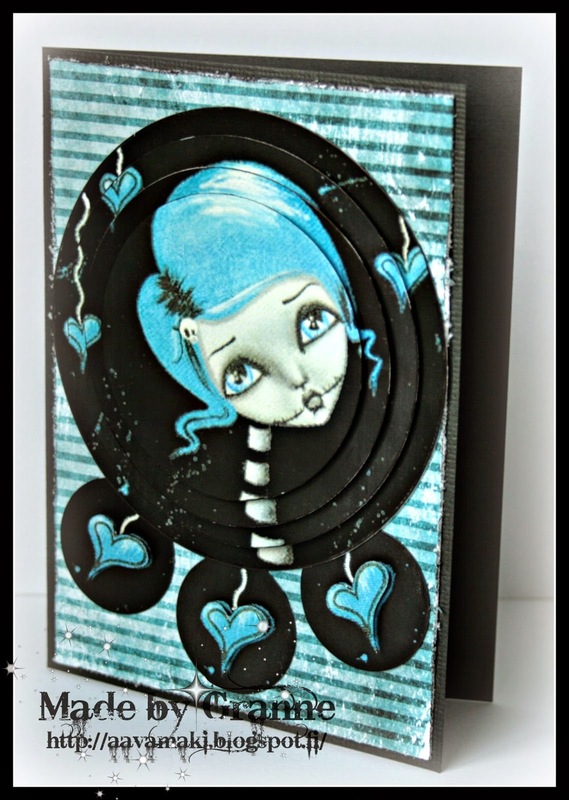 Use my diecut to cut them out (scissors for the small hearts) and layered pieces with 3D stickers. Really like how it turned out and it was so quick to make. Stunning color combo. Love your card with pyramage technique. Thank you for joining us at Digi Choosday Challenges. Monica DT. Great card! Good luck in the 2 Cute Ink challenge! Thanks for joining us at Crafting from the Heart this week.